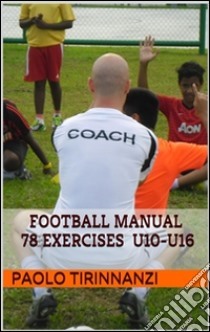 The manual is made personally by the author during his experience in 2013 in Malaysia as Technical Director and Head Coaches of Coerver Coaching Malaysia. The book contains 78 different football (soccer in USA) exercises for the player development from U10 to U16: how to increase the agility, coordination and speed, ball domain, ball control and passing, dummy without and with the opponing player, shooting, and attacking phase. Note: these are not the original Coerver Coaching's exercises, they are only exercises made personally by the author and could follow the Coerver Coaching's principles. To have the original Coerver Coaching's exercises you have to follow the specific courses that Coerver Coaching organizes around the world during the sport season, and get Coerver's diploma and licence.